As spring comes around the corner, flowers bloom and the promise of their beautiful colors is evident. Flowers are a key part of culture, and understanding floral design, maintenance, and marketing are all crucial for the flower industry to thrive. Luckily for the flower industry, many students expressed an interest in learning about it at the recent District Floriculture CDE. Within this competition students identified plants, tools, pests, and plant diseases. As well, students also learned how to make boutonnieres, work with a customer, and design an advertisement. At both CDE’s, hosted by Elkton FFA at Elkton high school, Sutherlin FFA was well represented with 15 different freshman competing for our Beginning Floriculture and Dairy Foods Teams and 25 upper classroom competing for both advanced teams. Student competed very well as all Sutherlin FFA teams took home a banner. Both our Advanced Floriculture and Dairy Foods teams moved on to the state level by placing first! As well, both Beginning teams took home a banner which was very impressive since this was their first time competing! Individual results are posted below. Each year, the Oregon FFA Association meets for a weekend full of competitions, recognition, workshops, business sessions, and much more. For the past two years, this convention has been held at the Deschutes County Fairgrounds in Redmond, Oregon. The theme of this year’s convention was Make Your Mark. The convention sessions carried messages about how FFA members can leave a positive influence in their communities. 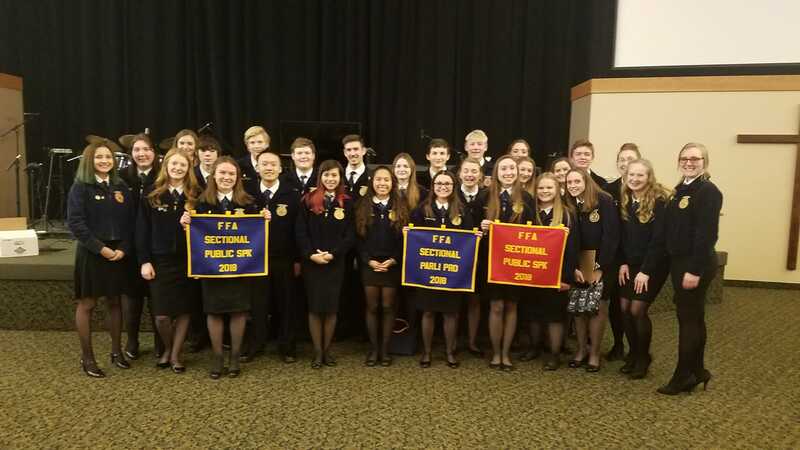 Although State Convention hosted about 4,000 people, Sutherlin FFA’s 20 attending members were able to leave a sizable mark. The weekend began with a 4:00pm Agricultural Issues presentation. The Ag Issues team consisted of five members (Tristan Vincent, Aisia Carrillo, Keaten Clarno, Grace Matteo, and Hailey Boehm). Prior to the event, the team was instructed to research an issue pertaining to the agricultural industry and create a skit which demonstrates the differing viewpoints of that issue in a real-life scenario. Our team spent hours researching and preparing for their presentation on the Sage Grouse. It is the first Ag Issues team that Mr. Crawford has led. They made the chapter proud by moving into the final round to win third place in the state. The next to compete was Mackenzie Price and Cassidy Leatherwood in the Prepared Public Speaking Career Development Event (CDE). Their task was to deliver a speech relating to agriculture. They were graded on their tone, body movements, response to questions, and much more. Mackenzie’s speech was on the power of urban agriculture to feed the world in the future. Cassidy’s speech was on Africa’s agricultural potential and its impact on the global food crisis. Mackenzie brought home a fourth place banner for her delivery. This year’s Advanced Parliamentary Procedure team included Regan Leatherwood, Nolan Carson, Mackenzie Price, Sydnee Tilley, Skyer Harrington, Zach Lor, and Tommy Williams. Many of these members competed in the National Beginning Parliamentary Procedure CDE in the fall. The team performed very well and it was clearly a tight competition. However, Sutherlin was able to win first place for the second year in a row. The team will go to Indianapolis in October to compete in the national CDE format. 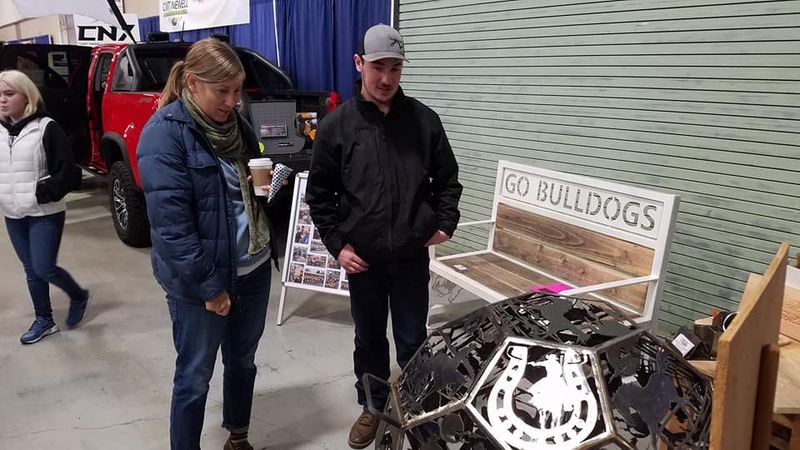 The first weekend of March was the annual Douglas County Home Show, and the Sutherlin CTE Program was well represented. The Home Show is an annual event run by the Umpqua Valley Home Builders Association. Businesses from around the area come to advertise their products and services. Sutherlin high school students from various metalshop, woodshop, technology, and agriculture classes came to help run the booth. 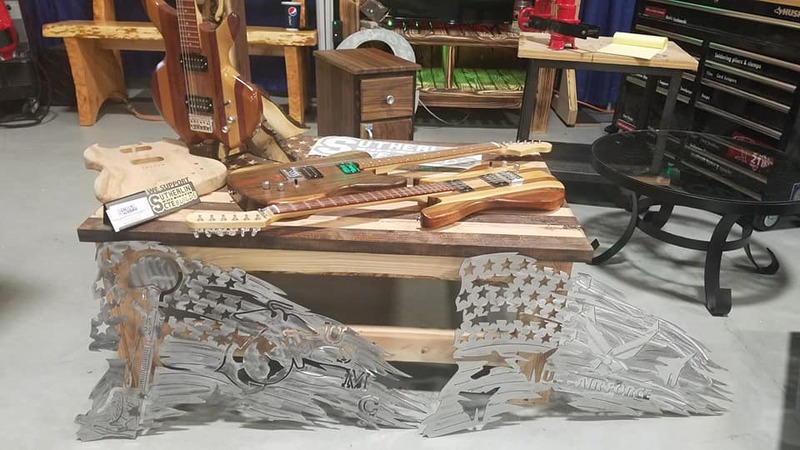 Madelyn Higgins, a FFA member and metalshop student, said “People loved that our art was different from other schools and that we had a lot of cool technology which allowed us to create those products. A lot of people wanted to donate too.” The Sutherlin CTE program’s booth was definitely large and diverse. Hundreds of people saw this year’s booth. The students involved in the CTE program hope that the Home Show will spread the word about what they are doing and about their small business which has grown to an online vendor called Etsy. This year’s Home Show was a success for Sutherlin High School. This trailer was made by Conner Grauf and Lane Miller. Tristan Vincent built the stand for the letters. Pictured above are some guitars made by advanced wood shop students last semester. Lane Miller explains one fo the metal art projects on display. 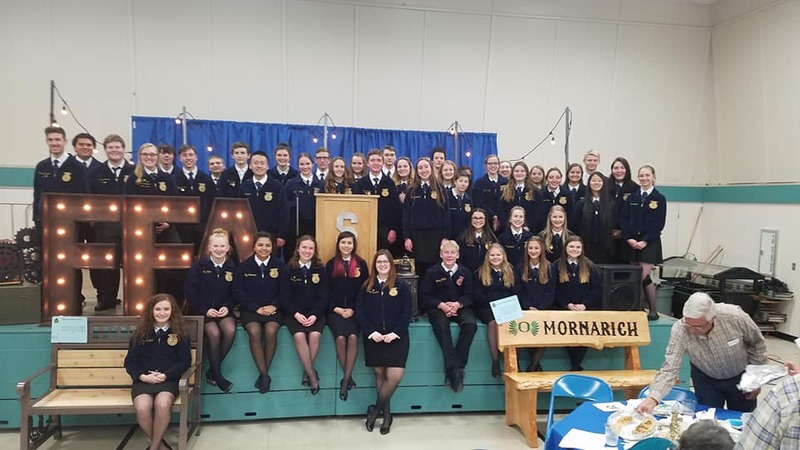 This past Monday, members from all across the state zipped up their jackets and traveled to Sutherlin Family Church where Sutherlin FFA hosted the Sectional Leadership CDE’s. Members competed in Parliamentary Procedure, Prepared Public Speaking, Extemporaneous Speaking, and Creed Speaking. There are four different sections across Oregon, making this an exciting event for Sutherlin FFA to host. Sutherlin FFA represented well as chapter volunteers ran a perfectly organized event and chapter competitors put their best foot forward in competitions. Sophomore Sydnee Tilley describes competing in Parliamentary Procedure, stating, “Sectionals this year was such a great experience! Being able to work as a team and win two years in a row was awesome. Doing competitions like these has really taught me hard work, leadership skills, and teamwork. 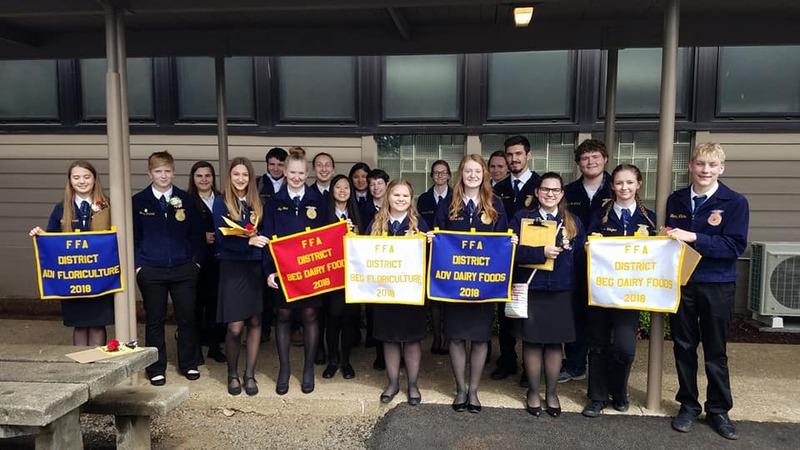 Through FFA I’ve gain many assets and I can’t wait to use them in the future.” Considered a state qualification level, members were competing against some of the best, and executed bravely, displaying grit and joy throughout the entire event. Job Crew volunteers and results are listed below. 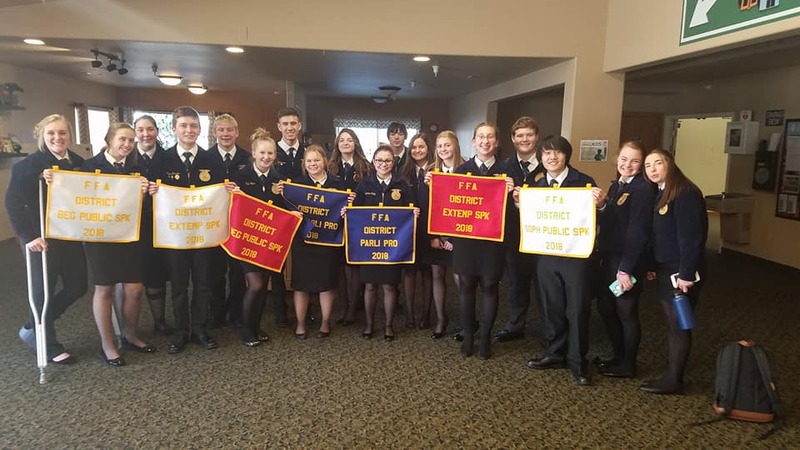 Earlier February members competed in a variety of Leadership CDE’s including Parliamentary Procedure, Prepared Public Speaking, Extemporaneous Speaking, and Creed Speaking at Sutherlin Family Church. Members did very well moving on to the sectional level in a variety of these competitions. Each competition plays to personal strengths, and each member can attest to their growth from these competitions. Senior and Chapter Vice President, Cassidy Leatherwood, describes her passion for competing in Public Speaking, explaining, “This competition gives me the chance to dig deep into an interesting topic and then share my perspective with an audience.” Whether debating a current issue in Parliamentary Procedure or reciting the FFA Creed, this event offers ample experiences for leadership growth and developing professional skills. Results are below. 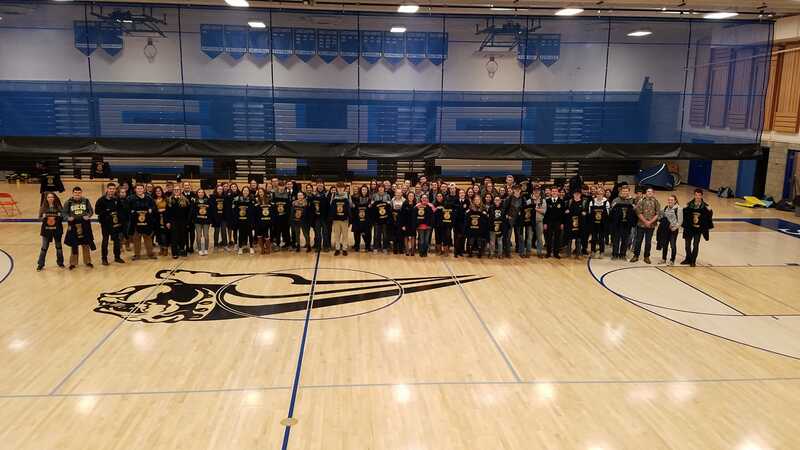 Annually, FFA members from across the nation all celebrate FFA Week, which is designed for members to promote leadership opportunities, advocate for agriculture, and celebrate the purposes of the National FFA Organization. Across the nation, students plan community service projects, participate in social events, and spread school spirit. This year FFA Week occurred from February 18-24. 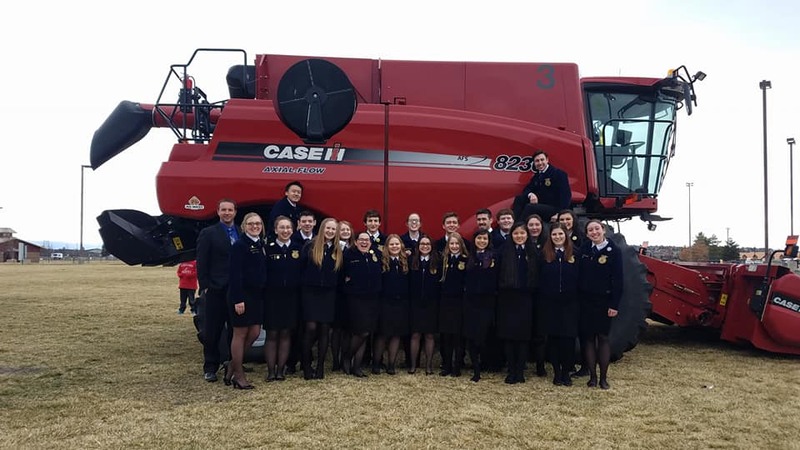 Sutherlin FFA’s FFA Week agenda included agriculture literacy workshops for all K-6 students, a chapter bonfire, lunchtime activities, and a school assembly. FFA provides each student individual growth and personal experiences. 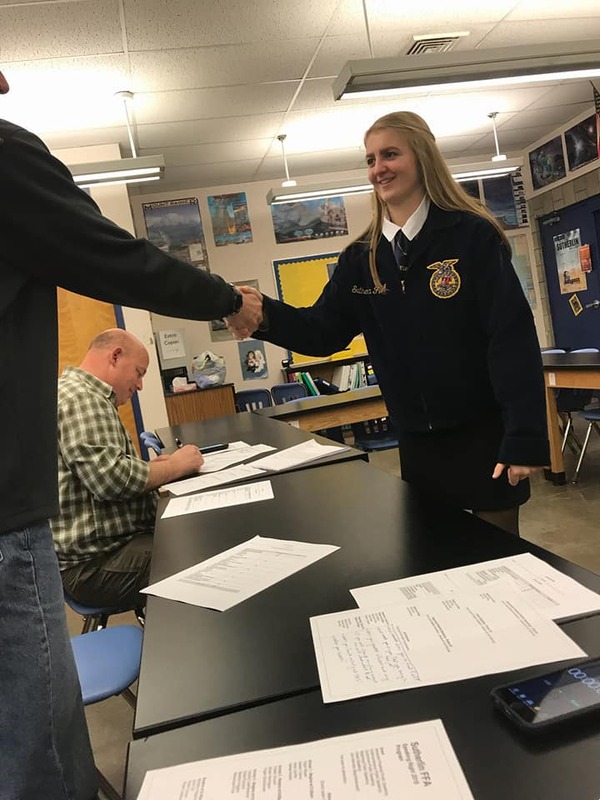 Senior Lacie Head explains, “FFA helped me grow by pushing my comfort zone in many different ways.” Throughout this week, members’ like Lacie reminisce in and celebrate the opportunities this organization provides. Most Successful FFA Alumni Auction Yet! On February 28, FFA chapter members volunteered at our local FFA Alumni at the Annual Sutherlin FFA Alumni Auction. Throughout the evening, members showed auction items, served dinner, sold 50/50 tickets, and networked with guests. The auction is a major event for members as the funds donated by the public pay for FFA travel experiences, CDEs, and senior scholarships. Support from both the Alumni and public guests allow students to thrive in many different aspects of their FFA and future careers, and members deeply appreciate this. 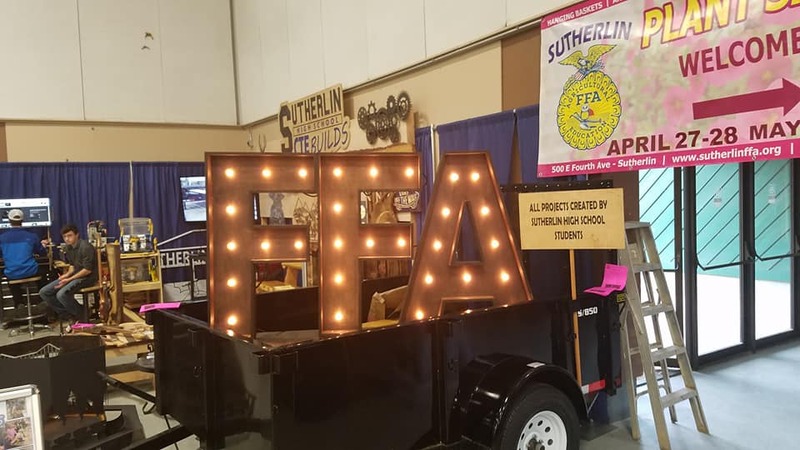 Junior Tommy Williams said, “The Alumni Auction went well, many of our supporters got to see what Sutherlin FFA can do and it was great to see everybody there.” This year’s profits made a new record, being the highest they have ever been. This is only possible through the Alumni and community’s support, and members are grateful for all the opportunities their support offers. "How would you like to give a competitive speech? Most people, even adults, would shrink at this idea. In fact, public speaking is the number one fear worldwide! However, Sutherlin FFA students are not so easily afraid and many stepped up the plate this last Monday at the Sutherlin FFA Chapter Speaking Night. Competing in Job Interview and Extemporaneous, Prepared, and Creeed Speaking events, students refined their communication skills. Career and Technical Education (CTE) programs are meant to give high school students practical skills that will help them as they enter the job force. These skills may be welding, woodworking, computer programming and design, agricultural education, and more. In recent years, some schools have struggled to keep CTE programs around and provide programs with adequate teachers. Sutherlin High School doesn’t have this problem however. Our CTE program happens to be one of the best in the state. In fact, for the past two summers, teachers from around Oregon have come to Sutherlin High School to take a week long course taught by Mr. Gary (Woodshop teacher) and Mr. Crawford (Metals and Ag Teacher). The course is meant to help inexperienced teachers with welding and woodworking skills. It has been incredibly successful. Last Monday, November 13, students from across the county met at Sutherlin High School to compete in two different competitions. Some students were competing in Vet Science: a career development event which includes a written test, math test, writing prompt, animal handling, and clinical practicums. Other students were competing in Ag Sales which involves selling various products in several different simulations.